The attorney general mischaracterized Obama-era restrictions while citing a study that actually says new computers reduce crime more than heavy weapons do. The Trump administration made false assertions to justify an executive order expanding police forces&apos; access to military equipment such as tanks and grenade launchers. 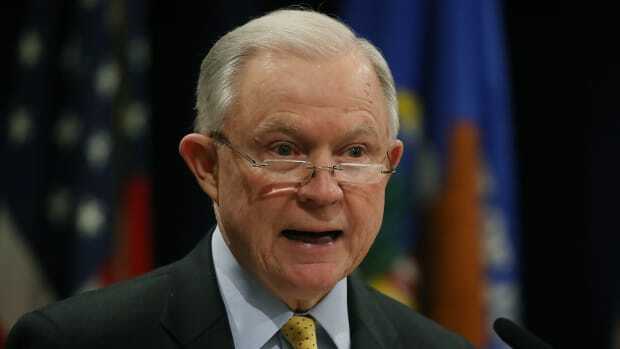 Attorney General Jeff Sessions announced on Monday that President Donald Trump would make defensive gear available to police again by undoing a policy from the Obama administration. Trump then signed an executive order whose title emphasized that branding: "Restoring State, Tribal, and Local Law Enforcement&apos;s Access to Life-Saving Equipment and Resources." "He is rescinding restrictions from the prior administration that limited your agencies&apos; ability to get equipment through federal programs, including life-saving gear like Kevlar vests and helmets and first-responder and rescue equipment like what they&apos;re using in Texas right now," Sessions said in the speech. But that&apos;s not what the Obama administration&apos;s restrictions did, according to documentation from a unit inside of Sessions&apos; own Department of Justice, the Bureau of Justice Assistance. Kevlar vests were never subject to any restrictions. Most helmets weren&apos;t either. Riot helmets (defined as those with shields over the face), Humvees, and helicopters that are sometimes used in rescue missions, were still available to police forces as long as they explained why they needed them and certified that they had protocols and training in place so officers would use them safely. That requirement was dropped for riot helmets last October. "Kevlar vests were never on any lists. That part is simply lying about what we did," said Roy Austin, who worked on the Obama policy as a deputy assistant to the president for the Office of Urban Affairs, Justice and Opportunity. "He was being untruthful about helmets as well." 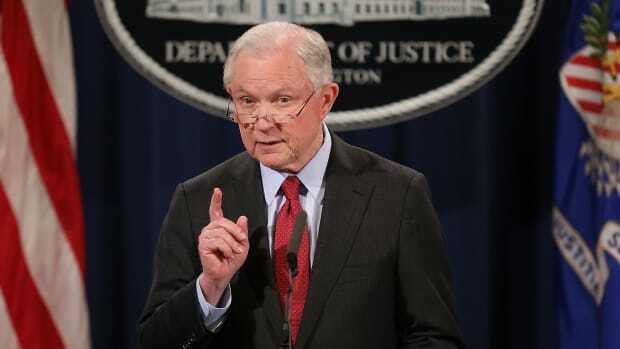 A Department of Justice spokesman acknowledged that the items Sessions cited were never prohibited by the Obama administration and that only some of them were even subject to additional procedures. Still, the spokesman, who did not want to be named, said: "There is absolutely nothing misleading about what the attorney general said." What the Obama administration did actually prohibit were tanks, weaponized vehicles, .50 caliber guns, grenade launchers, bayonets, and digital-pattern camouflage uniforms. Those restrictions applied only to purchases using federal dollars through a Pentagon surplus program. Police departments remained free to buy them with state, local, or private funds. "The attorney general and whoever advised him on these policies didn&apos;t read them carefully and didn&apos;t understand what they actually did," said Ed Chung, who worked on the Obama administration policies in the Department of Justice&apos;s Office of Justice Programs. "The safety of officers was never jeopardized because the overwhelming majority of equipment, including the ones cited by the attorney general, were still available to law enforcement." The Obama administration implemented the restrictions in the spring of 2016 in response to public concerns over the display of military-style hardware deployed by police to control riots in Ferguson, Missouri, after an officer fatally shot Michael Brown. Chung said the administration worked with civil rights organizations and police groups in an effort to meet law enforcement agencies&apos; needs while improving their relations with the communities they protect. Sessions, in his speech, harshly dismissed such considerations. "We will not put superficial concerns above public safety," he said. The attorney general asserted that the types of equipment limited by the Obama administration saved an officer from a bullet at the Pulse nightclub shooting in Orlando and helped police pursue the shooters in San Bernardino. But that&apos;s not accurate either. As shown in the very articles that Department of Justice officials provided to reporters to support Sessions&apos; speech, the Orlando officer&apos;s helmet that blocked the bullet wasn&apos;t a riot helmet, so it never faced any restrictions. And the armored vehicles used in San Bernardino had wheels, so the Obama policy still permitted them, with the additional precautions described above. The Obama administration only prohibited buying tanks (armored vehicles that run on tracks instead of wheels) using federal resources. By repealing the Obama administration’s policy, the Trump administration also abolished reporting procedures to help the government keep better track of the equipment it distributes. 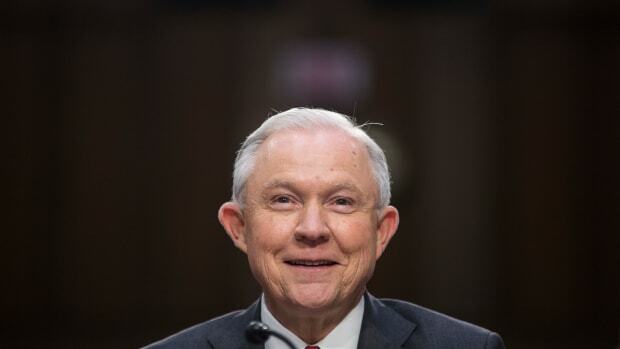 Sessions shared an anecdote in which a sheriff told him that the Obama administration "made his department return an armored vehicle that can change the dynamics of an active shooter situation." The Obama administration did ask those few departments that had tanks to return them, according to Chung and Austin, but offered to replace them with equivalent wheeled vehicles. "For every tracked vehicle, we replaced it with a wheeled vehicle so they didn&apos;t lose anything," Austin said. "His anecdote makes no sense because it skips the whole part that if they really needed this thing, all they had to do was say we want a replacement and we&apos;d provide a replacement." 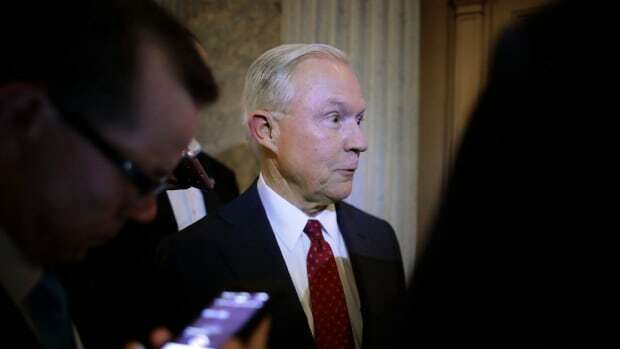 Sessions&apos; anecdote referred to Sheriff Mike Bouchard of Oakland County, Michigan, who is also vice president of government affairs for the advocacy group Major County Sheriffs of America. In an interview, Bouchard confirmed that the Obama administration replaced his tracked armored personnel carrier with a wheeled one, but he said the wheeled version wasn&apos;t as useful on the sandy and marshy terrain he has in his county. The Department of Justice spokesman said the Obama administration&apos;s additional measures were onerous because departments had to demonstrate a "clear and persuasive" need for the equipment, certify approval from a civilian governing body and keep records of incidents when the equipment was used. By repealing the Obama administration&apos;s policy, the Trump administration also abolished reporting procedures to help the government keep better track of the equipment it distributes. The Government Accountability Office recently tested the controls in the same program by creating a fake agency that was able to obtain $1.2 million worth of night-vision goggles, and simulated pipe bombs and other potentially lethal items. "We viewed the Obama reforms as very modest," said Kanya Bennett, a lobbyist for the American Civil Liberties Union. "We&apos;re certainly disappointed not only by the action that the administration took on Monday but again in suggesting to the public that the previous administration had taken away critical tools for law enforcement. In reality, there was very little that the Obama administration did with respect to taking military weapons and equipment out of rotation for state and local law enforcement use." Sessions&apos; speech cited studies showing that such equipment reduces crime, and assaults on officers and complaints against them. In the materials provided to reporters, Department of Justice officials pointed to a pair of studies in the American Economic Journal. But those studies considered all equipment supplied through the Pentagon&apos;s surplus program, without distinguishing the items the Obama administration restricted. They also studied the years 2006 to 2012, before the Obama policies took effect. "Our findings do not necessarily mean that saturating our local law enforcement agencies with military hardware is good policy," researchers at the University of Tennessee wrote in one of the papers. "These results should not be used to diminish concerns about police-community relations, the role of police in our society, violence against civilians by police, or vice versa." The other study observed that the type of equipment that had the biggest effect on reducing crime was non-lethal non-military gear, such as computers and office supplies. The researchers suspect that&apos;s because those supplies free up time and money for officers to spend on policing. "There is a tendency to conflate military equipment with weapons," the lead researcher, Vincenzo Bove at the University of Warwick of England, told ProPublica in an email. "Whereas we find that weapons is an unproductive category (it does not significantly affect crime) the miscellaneous category has the strongest effect, followed by vehicles and gear." "We do not explore the effect on crime of the items prohibited under the Obama policy," Bove added. "But, as most of the prohibited items were weapons, note they do not seem to have (in aggregate) any effect on crime." 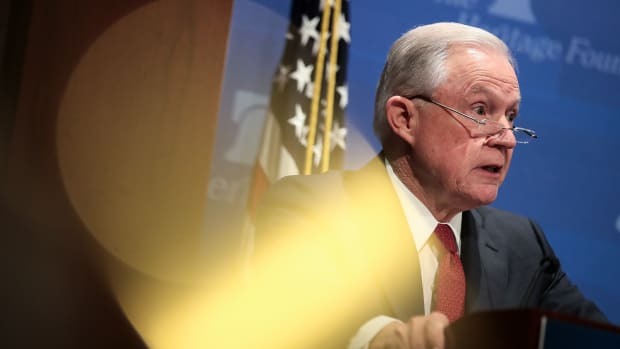 Sessions announced the change of policy at a meeting of the Fraternal Order of Police, which viewed repealing the Obama-era restrictions as one of its top-priority asks for the Trump administration. "The previous administration was more concerned about the image of law enforcement being too &apos;militarized&apos; than they were about our safety," the organization&apos;s president, Chuck Canterbury, said in a statement. But not all police groups agree. The Obama policy was sensible to restrict non-essential lethal equipment like bayonets and to encourage police to consult local elected officials before acquiring equipment that could be controversial, said Jim Bueermann, president of the Police Foundation and a retired police chief in Redlands, California. "The Obama executive order represented a best practice for acquiring military surplus equipment for local policing, and I still think it could serve and should serve as a best practice even though the rules have changed," he said. "I was supportive of the overarching goals of the previous executive order, but I also understand what this president is trying to do. I view this through the lens of a police chief, and I would say to my city manager and council, &apos;Ignore all of this that&apos;s the federal government&apos;s activity—under both sets of rules, we should still go to the public to explain our rationale.&apos;"
This post originally appeared on ProPublica as "How Jeff Sessions Misrepresented the Trump Administration&apos;s Expansion of Military Supplies for Police" and is republished here under a Creative Commons license. Isaac Arnsdorf covers politics, influence, and the Trump administration for ProPublica. 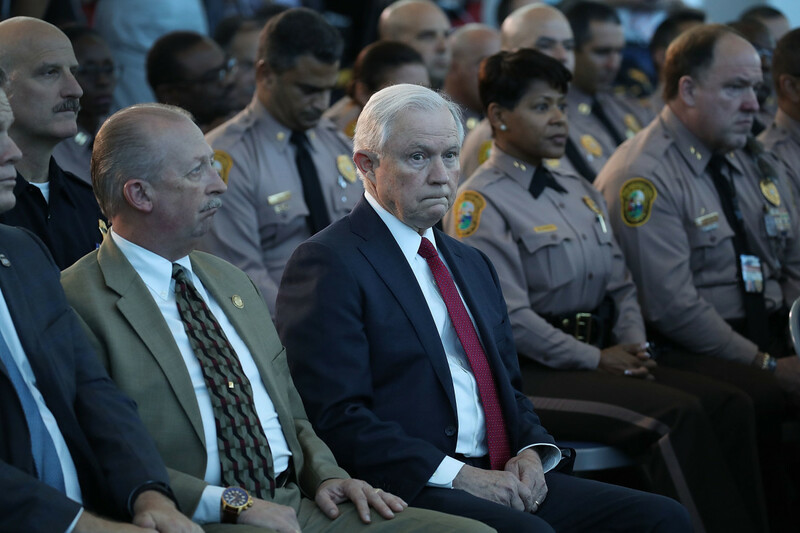 Before leaving office, Sessions signed an order to ensure that the Department of Justice disengaged from its role in investigating and reforming police departments that repeatedly violate citizens' civil rights. In the U.S., the question of marijuana legalization is no longer where and how—it's when. Just don't tell that to the attorney general.